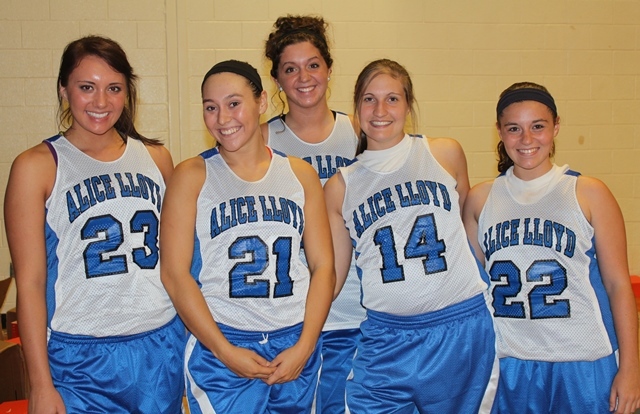 The Alice Lloyd Lady Eagles are coming off a season where they were a bucket away from reaching the finals of the Kentucky Intercollegiate Athletics Conference tournament. Overall, it was a strong season (18-11, 10-5 KIAC) for the squad, despite its unfortunate conclusion. However, this is a new year and each year tells its own story. Most of last season’s roster has remained intact for this 2013-14 campaign. Coach John Mills says that the team performed well last year, but injuries and other adversities stopped the team from achieving much more. This year, the Lady Eagles are expected to compete for the conference title and a potential National Association of Intercollegiate Athletics (NAIA) tournament bid. Speaking of upperclassmen, the Lady Eagles will have both of their star players back from last season in point guard Carla Booth and forward Ariel Nickell. Nickell, now a senior from Tazewell, Tn., led the team in scoring and rebounding, while Booth, a junior from Warfield, Ky., led the team in assists and was its second leading scorer. The team’s success depends a lot on how the two perform. Mills explained what kind of luxury it is to have both of them out on the court. The addition of Booth last season took a lot of stress off of Nickell to make a basket in a critical moment. However, as with any new situation, Booth and Nickell initially struggled to play well together, because their timing and chemistry were off. As the season progressed, the duo was able to develop a good rapport with each other, which made them difficult to stop. Nickell is grateful for the transfer from Eastern Kentucky University. While these two are dazzling together, it takes the contribution of all five players on the court to win a game. Mills insists that Booth and Nickell are cognizant of that. The head coach also mentioned that it is important for each player to know their role because not everyone can be a star. Mills and Nickell expect Megan Jones, a sophomore from Paintsville, Ky., to be that player. The point guard has arrived on campus with a tougher attitude and is improving every time she steps onto the court. #22 Megan Jones and #14 Courtney Crowder with new and returning teammates. With all-star caliber players like Nickell and Booth on the team, the rest of the squad’s strong and dependable players can tend to get overlooked. One such player is Courtney Crowder. A senior from Harrogate, Tn., Crowder is arguably the team’s best on-ball defender; however, her contributions haven’t gone unnoticed by Coach Mills. Crowder, though, according to Mills, is not a player who craves the spotlight; she just wants to get the win. As for the program’s new recruits, Coach Mills is ecstatic. Mills talked about Emily Clonte’s (London, Ky.) excellent shot-making ability, and Tailor Morgan’s (Rutledge, Tn.) skill in driving the ball and being able to penetrate the lane. Then, there’s Amber Shepherd (Hueysville, Ky.) who, as a guard, has the capability to post up on the block and can provide mismatches offensively. Taylor Arthur (London, Ky.) and Morgan Chestnut (Manchester, Ky.) pose an intimidating presence in the paint with their size and shot-blocking skills. The rest of the Lady Eagles’ roster includes Serena Nickell (sophomore from Tazewell, Tn. ), Sophia Shearer (sophomore from Berea, Ky.), and Courtney Stiltner (freshman from Tolsia, West Va.). Alice Lloyd’s veteran players — Nickell, Crowder, and Booth — will be called upon to lead and guide the team’s wealth of young players. With such talented leadership, Coach Mills can count on his team being ready to face the challenges that await them, both now and in the future. The Lady Eagles open the season on November 5th in a home matchup versus Kentucky Christian University at 5:30 PM. UPDATE: The Lady Eagles have been ranked #1 alongside Point Park University in the KIAC preseason coaches’ poll.